On a visit to the ProbityBooks.com, you have an easy to fill form designed to make registration simple with a brief information required to get started on FREE TRIAL. 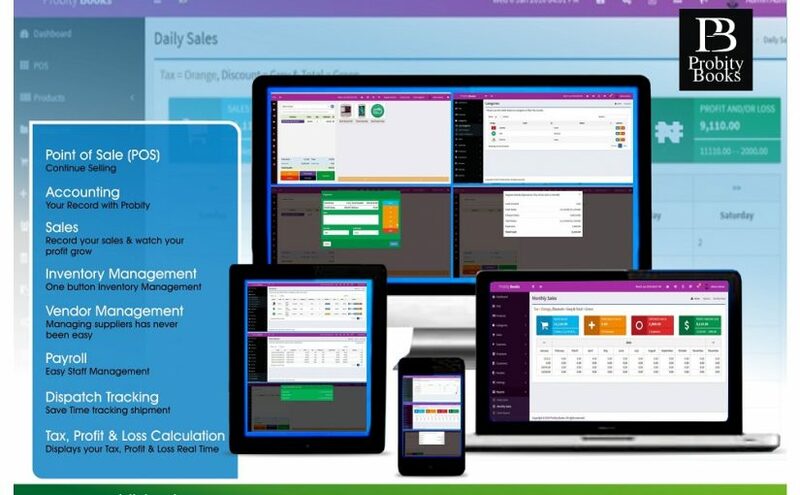 On the dashboard, you have an interactive chart that summarizes all your sales activities for a particular period. Above the chart, you’ll see a quick link to POS, Product/Services, Sales, Opened Bills, Categories, Customers, Settings, Report & Expenses. This feature lets Retailers, distributors and service businesses to record all sales made or cash received from customers on a daily basis. You can also hold sales with no immediate cash payment using the ‘Hold‘. At the top right, you’ll see a bell with an orange colour notification, click and view all opened bills. On this window, you will see all the products and services you sell to customers with more details like image, code, name, type, category, quantity available, tax, cost and selling price per unit. The product window has a built-in feature for importing your existing list, print barcode and labels. Find all the sales transaction entered via POS on a real-time including total sales for each day and tax deductions. you can also track all the expenses incurred including the amount spent and purpose of the transaction. You can view all the existing customers and their details on a single dashboard. The vendor section lets you track all product orders sent to suppliers with details of purchase transactions. The report has been made flexible for anyone to interpret; from daily sales, monthly, sales report to Auditor’s report, ProbityBook lets you track your performance in a very simple and easily understandable format. ProbityBooks is powered by Hacom Technologies Limited, an IT company that provides entrepreneur and business owners a sales management and accounting software that makes it easy for them to grow their businesses through better financial management.